Peace Boat is pleased to announce a 21-day Global University Programme on "Building Peaceful and Inclusive Societies Together in Asia" to be held from August 3 to 23, 2019. The call for applications is now open, with the first deadline on March 31 and the second deadline on April 30. 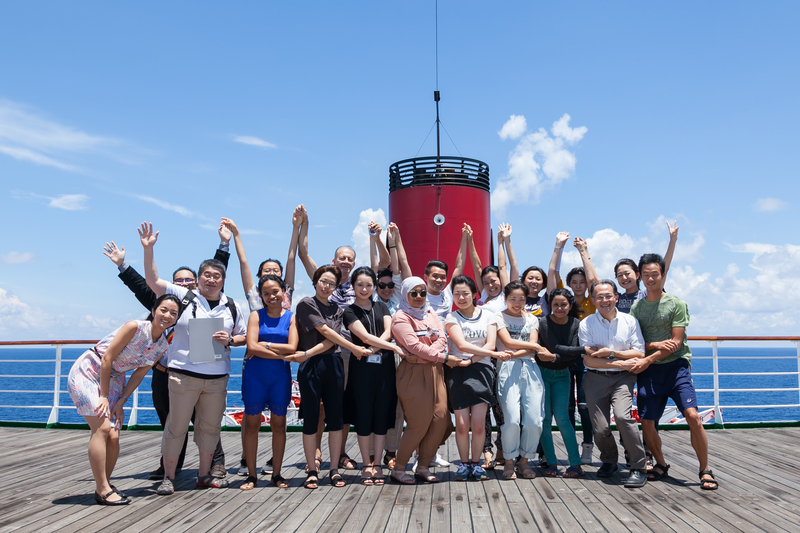 Peace Boat's Global University will organise a 21-day intensive course on "Building Peaceful and Inclusive Societies Together in Asia" from August 3 to 23, 2019. The programme will take place on Peace Boat's East Asia Voyage, which will visit 12 cities in Japan, South Korea, and Russia. Students and young professionals from across Asia will come together to learn from the region's past and present, and to discuss visions and actions for a peaceful and inclusive future. Underpinning the programme is Goal 16 of the UN Sustainable Development Goals (SDGs), which urges world governments to "promote peaceful and inclusive societies for sustainable development, provide access to justice for all and build effective, accountable and inclusive institutions at all levels." In different cities, participants will listen to the accounts of those who have suffered from conflicts or other forms of violence. What does it mean to live under the threat of violence? How do people deal with trauma, fear, and social divisions that wars and conflicts leave behind? What is justice that is inclusive and accessible? Participants will also meet with people who provide solutions to these difficult questions. The diversity of participants is also an asset. Throughout the programme, participants will learn from one another and discuss what it means to build peace for the people, with the people. Peace Boat's Global University is a short-term intensive educational programme conducted in English, which takes place at sea during Peace Boat's Global Voyages. Global University offers a unique curriculum combining "exposure" programmes (field visits) in ports and workshops and seminars onboard, addressing a range of global issues, including but not limited to, peace, human rights, and the environment. Throughout the programme, participants will have opportunities to witness first-hand what the consequences of global issues are for the people, countries, and communities they are visiting. They will also have ample chance to exchange opinions and experiences with other participants and discuss concrete action plans they can engage in to affect change in the region and the world. Peace Boat's Global University aims to empower students to use knowledge as a tool, take into account the voices of those directly affected by various problems, and become leaders who can build solutions to global problems with empathy and passion. Full reports (PDF) of past programmes can be downloaded here: 2015, 2016, 2017 and 2018. In 2015, the United Nations adopted the Sustainable Development Goals (SDGs), a set of 17 development goals to achieve by 2030. The SDGs call for all countries to foster prosperity, promote human rights, and protect the planet. Throughout the programme, participants will take seriously the philosophy behind the SDGs. What is Sustainable Development? What does it mean to leave no one behind? How can justice be a means to promote peace? Theme 1: Peace & Security in Asia: National Security, Human Security, and Common Security. Participants will look at the history of the Second World War and the Cold War, as well as present tension in the region to understand the issues of peace and security. Does national security ensure human security? What is human security? Is it possible to create a vision for common security in Asia? In thinking about these questions, participants will hear the first-hand accounts of the atomic-bomb survivors, former comfort women, and other victims of war and violence. Theme 2: Protecting Human Dignity: Human Rights and Justice. In order not to repeat the evils of conflicts, violence, and injustice, it is important to promote human rights and address issues of justice. What does justice look like to those who have suffered from violence, discrimination, and trauma? Is justice always necessary? What are the other ways of achieving reconciliation and building peace? Participants will look at some of the suffering still endured by many people living in the region, including by political, religious, ethnic, and sexual minorities. Theme 3: Means to Affect Change: International Law, Justice Mechanisms, and Political Actions. Societies can change for the better, but how? Participants will learn from the many initiatives that have come from people committed to making the changes they want to see in the world. These initiatives range from small community-based initiatives for justice and reconciliation to pushing for international laws that prohibit weapons with serious humanitarian consequences (e.g., landmines and nuclear weapons). Participants will also look at some dynamic direct political actions led by young people in the region. At ports of call, participants take part in exposure programmes. These programmes invite students to learn from people who are directly affected by these issues. By listening to personal accounts, participants grow in empathy and nurture a human-centered approach to global issues. Onboard, participants will engage in discussions, workshops, and roleplays to deepen their learning. By rigorously exchanging opinions with other participants from diverse backgrounds, participants learn to consider a wide range of opinions and propose potential ways forward. 1000 passengers from various countries travel together on the ship. In groups, students pick an issue, come up with a vision, set targets and goals, and plan and implement their own actions. These experiences can give participants the confidence to be agents of change in the future. Participants will meet in Osaka (Japan) on Saturday, August 3 and join Peace Boat's East Asia Voyage from August 4. The programme ends on Friday, August 23 in Kobe. Between August 10 and 14, participants will temporarily leave the ship for a 5-day exposure programme in South Korea and Russia. Participants will hear testimonies from atomic-bomb survivors to understand the suffering that continues to date. There will be exchange opportunities with local groups working for peace and nuclear weapons abolition, including some youth groups. Participants will visit several museums in the city. Through dialogues with local youth and among themselves, participants will be encouraged to find ways to talk about the history of the atomic bombings and WWII without being bound to a single country's perspective. Participants will explore security issues from various perspectives. Nuclear security will feature prominently through visits to sites related to the Korean War as well as nuclear power plant facilities. In Russia, there will be an opportunity to discuss regional security challenges with local students. In South Korea, participants will also hear from those who have been involved in the national democratization movement to discuss what it means to bring about the changes that they wish to see. Local guides will introduce participants to the history of the region, especially the discrimination and oppression that Ainu and forced laborers experienced as Japan modernized. Participants will also visit city hall and iron/steel works to hear about the benefits and costs of economic development. Participants will learn about the devastation and damage caused by the Great East Japan Earthquake in 2011. By interacting with groups working to tackle a range of social issues amplified by the disaster, participants will discuss what it means to make societies resilient. *Additional fees will be charged as follows: 21,600 JPY for port charges, 10,000 JPY for onboard tips, and 2,000 for international tourist tax. *Included are 1) full programme and tuition costs; 2) all expenses related to the exposure programmes; 3) accommodation and meals onboard Peace Boat; and 4) other miscellaneous expenses. Not included are 1) airfares and other travel expenses to Osaka and from Kobe; 2) travel insurance, 3) visa fees; and 4) other personal expenses. Students and young professionals from across Asia (but not exclusively), between the age of 18 and 35. Adequate command of English, sufficient to understand lectures and participate in discussions, is a minimum requirement. Please download the application form from here. Please fill in the required sections and email the form to univ@peaceboat.gr.jp. Please email univ@peaceboat.gr.jp, clearly indicating that your inquiry relates to "Peace Boat's Global University Programme".